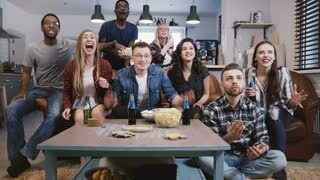 Happy friends or football fans watching sport match on tv and celebrating victory at home. Friendship, sports and entertainment concept. 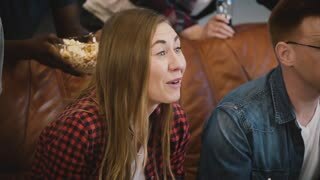 Girl watching sports on TV with friends. Slow motion. Female football fan. Emotional supporter celebrates success. Emotion. 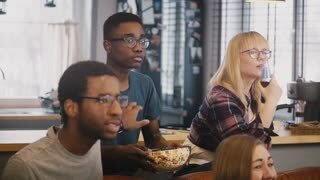 African American friends watch sports TV. Slow motion. Multi ethnic fans share victory celebration on couch. Multi ethnic friends watch sports on TV. Slow motion. Emotional football fans celebrate victory together. Side view. Romantic Caucasian couple celebrates victory. Slow motion. 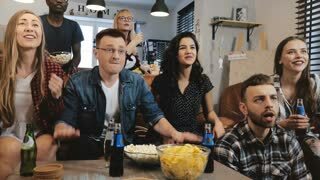 Diverse sports fans watching TV match. Emotional supporters. Happy friends watch sports on TV, celebrate victory. Diverse supporters fans shout together. Emotion. Slow motion. 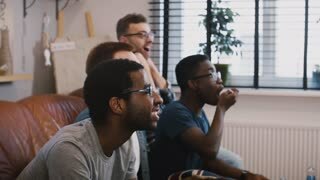 Multi ethnic friends watching sports on TV. Slow motion. Football fans celebrate win with snacks and drinks. Emotion. Multi-ethnic sports fans shout celebrating victory. Slow motion. Crazy supporters watch football game on TV. Emotion. Multi-ethnic young supporters celebrate success. Crazy fans watch football on TV. Win and victory. Sports. Wild emotion. Leisure, technology, sport, entertainment and people concept - man with remote control watching football or soccer game on tv at home. Fan, support, worry for your favorite team.